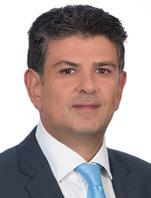 Christos joined KPMG Cyprus in 1994. He worked with KPMG Leeds between 1991 and 1994. He became a Partner in 1999. Christos has been involved with the audit of large financial institutions including major banks, insurance companies and investment funds. In 2016 he was appointed as the Deputy Managing Director of KPMG Cyprus. He also heads KPMG Advisory in Cyprus. In the past, he has been in charge of other departments in KPMG such as the Financial Services Department. Furthermore, he is a member of the Executive Committee of KPMG Cyprus. He is the Primary Contact for the Funds Services Unit of KPMG in Cyprus. With KPMG being the market leader in the registration and audit of Cyprus investment funds, he is heavily involved in the set-up and advisory of various Cyprus investment funds (non-UCITS as well as UCITS) and fund managers. He has delivered a number of seminars on the fund industry in Cyprus. He is also a founding member of CIFA (Cyprus Investment Funds Association) and is currently the Chairman of the AIF Committee of CIFA. Christos is also a member of the board of directors of the Institute of Certified Public Accountants of Cyprus. Christos’s area of expertise is in the advisory sector in relation to Financial industry and especially in the funds sector.